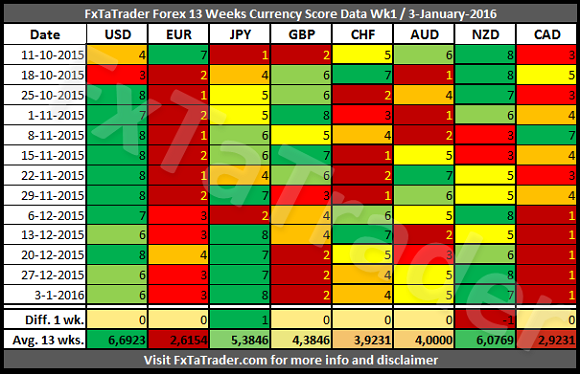 At the moment we can see that the CAD has the second lowest value in the 13 weeks average after the EUR. It has been lower than the AUD for 10 out of the last 13 weeks. For that reason the CAD now is a weak currency and the AUD an average currency. Same situation applies to the GBP compared to the NZD. 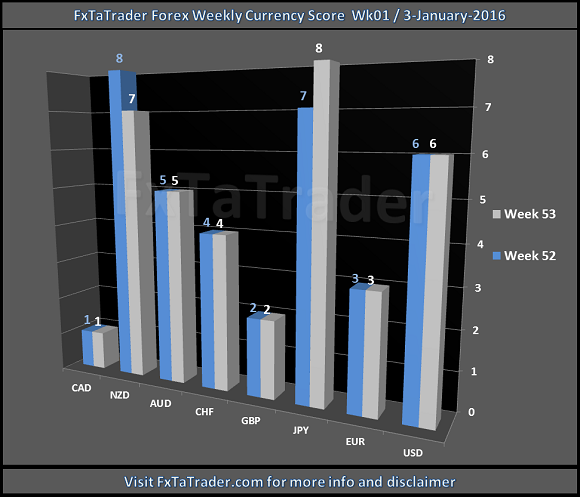 In this case the GBP has been lower than the NZD for 9 out of the last 13 weeks. For that reason the GBP now is an average currency and the NZD a strong currency. A good foundation is provided for looking at the Weekly and Daily Technical analysis chart of a specific pair by using the (1)"Ranking and Rating list", published earlier this weekend, with the above (2)"Weekly Currency Score" analysis and together with the (3)"Currency score difference" table with the (4)"Top Forex pairs table" where the Bollinger Bands analyses are made on the interesting pairs.